1Department of Horticulture, Lovely Professional University, Phagwara, Punjab, 144411, India. 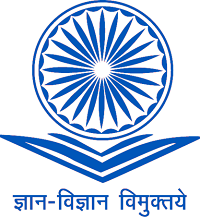 2Department of Vegetable Science, Punjab Agricultural University, Punjab, 141004, India. Pre-harvest foliar application of growth promoters like NAA (Naphthalene Acetic Acid), GA3 (Gibberellic Acid) and Triacontanol can be effectively used to improve yield and quality attributes of guava fruits. NAA (100-200 ppm), GA3 (25-75 ppm) and Triacontanol (5-15 ppm) applications were reported to bring improvement in yield and quality of guava fruits in comparison to control. The results of experiment revealed that foliar application of NAA 200 ppm recorded maximum fruit size (53.14cm2), fruit weight (138.53gm), specific gravity (1.17gm/cm3) and minimum seed weight (5.19gm) followed by NAA 150 ppm. The quality of fruits in terms of total soluble solids (11.47%), reducing sugar (4.48%), ascorbic acid (239.03g/100gpulp) and total sugar (7.43%) were also significantly higher with treatment NAA 200 ppm followed by NAA 150 ppm. Moreover, an application of NAA 200 ppm significantly reduced acidity (0.20%). Keywords: Ascorbic acid; Guava; NAA; GA3;Plant Growth Regulators; Triacontanol. Guava (Psidiumguajava L.) plants,a member of familyMyrtaceae, bear climacteric fruits and is usually known as apple of the tropics or the poor man’s fruit. Its origin is in tropical America and adopted well for commercial cultivation throughout tropics due to its hardy nature, prolific bearing, high ascorbic acid content (Negi and Rajan, 2007). Guava fruit contains 82.50 per cent water, 2.45 percent reducing sugar, 2.23 percent non-reducing sugar, 9.73 percent total soluble solids, 0.48 percent ash and 260 mg vitamin-C per 100 gm of fruit pulp as well as good amount of iron, calcium and phosphorus. These constituents may differ with the cultivar, stage of maturity and season. Guava ripe rapidly and being highly perishable, it can be stored for 2 to 3 days under ambient condition (Bassettoet al.2005). The quality of guava fruit is greatly affected by temperature and humidity. The development of sweetness, color and aroma depends on low temperature and dry atmosphere, due to which the fruit quality of winter fruits is better than rainy. Rainy season crop has high production but quality is poor due to insipidness (Singh etal. 1996) and infestation of pest (Rawal and Ullasa, 1988). Though the fruit quality of winter season crop is better, but fruits remain small in size; becomes too hard and lack ripening due to low temperature. Thus, there is need of standardization of practices to bring further improvement in fruit yield and quality in winter season.Growth regulator like GA3 and NAA affects flower and fruit setting, cell growth, apical dominance, geotropism and photoperiod. GA3 had the highest fruit retention and yield followed by Amcotone, activated dry yeast and NAA in both winter and rainy seasons. The growth regulators spray in addition increases fruit weight, total soluble solids (TSS), fruit weight, carotene, reducing sugars, total sugars and vitamin-C and decreased tannin and fruit acidity. The Triacontanolis present as a natural component of plant wax and bee wax (Abubakaret al. 2013). The pre-harvest sprays of growth regulators and minerals are the new practices nowadays adopted for higher fruit production and improved fruit quality (Dutta and Banik, 2007 and El-hilaliet al. 2003).All these chemicals have positive impact on number of seeds per fruit, fruits per plant, fruit setting and fruit set percent. Thus, study was carried to identify the effectiveness of growth regulator (NAA, GA3, Triacontanol) to improve yield and quality attributes of guava cv. Allahabad Safeda in winter season. The investigationwas carried out during 2014-15 on three year old trees of Allahabad Safedaguava planted at a distance of 3×3 m apart at Guava orchard, located at main Experiment Station of Lovely Professional University, Phagwara, Punjab. The trees were sprayed with NAA 100ppm (T1), NAA 150ppm (T2), NAA 200ppm (T3), GA3 25ppm (T4), GA3 50ppm(T5), GA3 75ppm (T6), Triacontanol 5ppm (T7), Triacontanol 10ppm (T8) andTriacontanol 15ppm (T9) and result was compared with control (T0). Ten fruits were randomly selected from each replication and average fruit weight, seed weight per fruit, average fruit size and specific gravity were recorded. The chemical parameters like total soluble solids in 0Brix was determined by using hand refractometer and was expressed in percent, titratable acidity was determined as citric acid by titrating against N/10NaOHalkali solution and was expressed in percent,ascorbic acid or Vitamin-C present in fruit was determined by using dye 2,6 dichlorophenol indophenol (DCPIP) through visual titration method and was expressed in g per 100g of pulp whereas reducing, non-reducing and total sugar wereestimated by Lane and Eynon’s method and were expressed in percent (AOAC, 2000).Significance of differences among various treatments was analyzed by using RBD for each parameter at P≤0.05 as advocated Duncan’s Multiple Range Test (DMRT). (53.14 cm2) was obtained from application of NAA 200 ppm (T3) followed by T2 (NAA 150 ppm) and T6 (GA3 75 ppm). The improvement in size of guava fruits due to pre-harvest foliar application of various concentration of NAA might be result of enhanced internal physiology during fruit development which induced efficient utilization of resources like water, nutrients and other vital compounds. Jain and Dashora (2011) also observed maximum diameter 7.30 cm due to pre-harvest application of 200 ppm NAA in guava. In a similar study,Dutta and Banik (2007) reported increased fruit size, weightand yield in sardar guava when NAA and GA3 with nutrients were applied before fruit setting and again 3 weeks after fruit setting. Thecurrent findings are also in agreement with the results proposed byRanjanet al. (2003) who confirmed that stimulated cell division and cell elongation due to application of NAA and GA3 may be the reason behind increased fruit size. The fruit weight was reported to be varied from 78.37g in triacontanol5ppm (T7) to 138.53 gm in NAA 200 ppm (T3) in comparison to minimum (72.11g) in control (T0). On comparing all the treatments, it is clear that the mean value of concentration of NAA induced maximum fruit weight which was 1.8 times more than control. The maximum fruit weight (138.53g) was recorded due to application of NAA 200ppm (T3) followed by 132.8g from NAA 150ppm (T2) and 122.07g from GA3 75ppm (T6).This increased fruit weight with increased NAA concentration might be due to the fact that NAA mediated higher level of metabolites from the leaves towards fruits which resulted in heavier fruits than other treatments. The results are in accordance with findings of Bhosleet al. (2002) and Meena (2008). The application of NAA induced cell elongation by enlargement of vacuoles and loosening of cell wallwhich caused increase in fruit weight, fruit number and yield (Agrawal and Dikshit, 2008) and is being confirmed by the findings of Yadav et al. (2001) in guava fruits. All the treatments have significantly reduced seed weight in comparison to control (T0). It is clear from the data that the minimum seed weight (5.19 g) was recorded with chemical spray of NAA 200 ppm (T3) followed by NAA 150 ppm (T2) and NAA 100ppm (T2). The maximum seed weight (6.57 g) was observed with T0 while all the treatments showed reduction in seed weight as compared to control (T0). This reduction in seed weight with NAA applications might be due to reduction in number of healthy seeds especially at higher NAA concentrations.The outcomes of the current investigations are in line with the results obtained byLewin and Monselise (1976) who reported reduced number of healthy seeds with NAA application. Similarly, Agnihotriet al. (2013) had also reportedminimum seed weight due to treatment with 300 ppm NAA. All the treatments significantly improved specific gravity in comparison to control (T0). The highest specific gravity (1.17 g/cm3) was reported with application of NAA 200 ppm (T3) followed by 1.14 g/cm3 in NAA 150ppm (T2), 1.13 g/cm3 in NAA 100ppm (T1) and 1.12 g/cm3 in GA3 75ppm (T6).The decrease in specific gravity of fruits during ripening might be due to conversion of insoluble starch into soluble sugars. Thus, pre-harvest application of plant growth hormones reduced the weight loss and respiration losses which were helpful in maintaining higher value of specific gravity(Godge and Kale, 1991). The observation pertaining to chemical composition of guava fruits influenced by pre-harvest foliar spray of different plant growth regulators like NAA, GA3 and Triacontanolare presented in Figure-1 and 2.The acidity was significantly decreased with foliar spray of NAA, GA3 and Triacontanol. It is clear from the data that the maximum acidity (0.43%) was observed with control (T0) whereas the minimum acidity (0.20%) was recorded with NAA 200 ppm (T3) followed by 0.22% in T2 (150 ppm NAA).Thus, with increase in NAA concentrations the titratable acidity was decreased which may be due to early ripening of fruits caused by treatment, where acid might have been used during respiration or rapidly converted into sugars. Similarly, Agnihotriet al. (2013) had recorded minimum acidity (0.27%) in guava under foliar application of 300 ppm NAA.The findings of current investigations are in accordance with the findings of Dubey et al. (2002); Xiao et al. (2005) and Garasiyaet al. (2013). The vitamin-C content in fruits varied from 221.15 mg/100gmpulp in control (T0) to 239.03 mg/100gm pulp in NAA 200 ppm (T3). 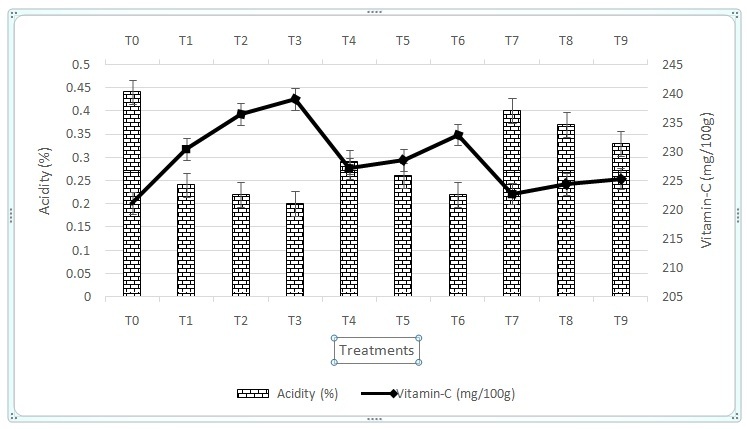 The result further indicated that all concentrations of NAA and GA3had high value of vitamin-C content in comparison to mean value (228.79 mg/100g). The improvement in the ascorbic acid content of guava fruits might be due to increased synthesis of metabolites which can stimulate the synthesis of the ascorbic acid precursor (Orzorek and Angell, 1974). Similarly, Jain and Dashora (2011) reported maximum ascorbic acid (205.18mg/100g pulp) due to application of 200 ppm NAA treatment. This result is in accordance with the result obtained byGarasiyaet al. (2013) in guava fruits. The TSS (Figure-2) of fruits significantly increased with foliar application of growth regulators, viz., NAA, GA3, Triacontanol. The minimum total soluble solids (9.170 Brix) were recorded in control (T0) whereas, the maximum total soluble solids (11.470 Brix) were observed in guava fruits treated with NAA 200 ppm (T3).The increase in TSS might be due to synthesis of auxin which inturn increased synthesis of metabolites and their rapid translocation from other parts of plants to developing fruits. Thus, NAA treated fruits acted as a strong sink for drawing metabolites from the leaves. Similarly, Rajput and Singh (1977) estimated higher percentage of total soluble solids from the fruits treated with NAA over control. 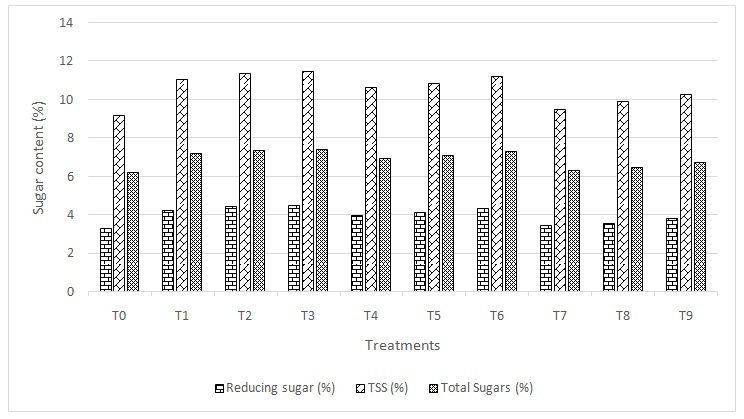 Total sugar (Figure-2) content in fruits significantly increased from 6.22 % in control (T0) to 7.43 % in NAA 200 ppm (T3) while reducing sugar was ranged from 3.28 % in control (T0) to 4.48 % in NAA 200 ppm (T3). Higher quantity of soluble carbohydrates in the cell sap and higher glucose concentration in fruits treated with NAA was due to marked increase in carbon assimilation, thereby favoring better electrolytic composition. Kassemet al. (2010) and Chaudhary et al. (1990) revealed that reducing sugar content significantly increased with foliar application of NAA which confirms the findings of present investigation and is in agreement with the results obtained by Garasiyaet al. (2013) in guava fruit. The present investigation clearly reflects the ability of pre-harvest application of NAA 200ppm and 150 ppm as an efficient technique to improve the physico-chemical attributes of guava fruits. GA3 75 ppm and NAA 100 ppm are also effective to enhance the yield related attributes of guava fruits in winter season. The authors would like to give their sincere thanks to Lovely Professional University- Punjab, India for the professional and financial support in the research. O.A.C. : Official methods of analysis, 17th edn. Association of Official Agricultural Chemists Washington, DC, 2000. Bassetto, E., Jacomino, A.P., Pinheiro, A.L., Kluge,R.A. : Delay of ripening of ‘Pedro Sato’ guava with 1-methylcyclopropene. Postharvest Biology and Technology, 2005; 35: 303-8. Negi, S.S.,Rajan, S.: Improvement of guava through breeding. Acta Hort., 2007; 735: 31-8. Singh, G., Pandey, D., Rajan, S., Singh, A.K. : Crop regulation in guava through different crop regulating treatments. Fruits, 1996; 51: 241-6. Rawal, R.D., Ullasa, B.A. : Management of fruit diseases of guava Psidiumguajava through fungicidal sprays. Indian J. Agric. Sci., 1988; 58: 950-2. Dutta, P., Banik, A.K. : Effect of foliar feeding of nutrients and plant growth regulators on physicochemical quality of Sardar guava grown in West Bengal. Acta Hort., 2007; 335: 407-11. El-halali, F., Ait-Oubahou, A., Remahl, A.,Akhayat,O. : Chilling injury and peroxidase activity changes in “Fortune” mandarin fruit during low temperature storage. Bulgarian Journal of Plant Physiology,2003; 29: 44-54. Abubakar,A.R., Ashraf,N., Ashraf,M. : Effect of plant biostimulants on fruit cracking and quality attributes of pomegranate cv. Kandhari Kabuli. Academic Journals, 2013; 8: 2171-5. Jain, M.C., Dashora, L.K. : Effect of growth regulators on physic-chemical characters and yield of guava cv. Sardar under high density planting system. Indian J. Hort., 2011; 68: 259-61. Ranjan, R., Purohit, S.S. Prasad, V.: Plant Hormones: Action and Application. Agrobios, India, 2003;pp 183–189. Bhosle, A.B., Khorbhade, S.B., Sanap, P.B.,Gorad, M.J.: Effect of plant hormones on growth and yield of summer tomato. (Lycopersiconesculentum). Orissa J. Hort., 2002; 30: 63-5. Meena, R.S. : Effect of GA3 and NAA on growth, yield and quality of tomato (Lycopersiconesculentum). Current Agriculture, 2008; 32:83-6. Agrawal, S., Dikshit, S.N. : Studies on the effect of plant growth regulators on growth and yield of Sapota (Achrassapota) cv. Cricket Ball. Indian J. Agric. Res., 2008; 42: 207-11. Yadav, S., Bhatia, S.K., Godara, R.K., Rana, G.S. : Effect of growth regulators on the yield and quality of winter season guava cv. L-49. Haryana J. hort. Sci., 2001; 30: 99-100. Lewin, I.J., Monselisi,S.P. : Further studies on the reduction of seeds in mandarins by NAA spray. Hort., 1976; 4: 229-34. Agnihotri, A., Tiwari, R., Singh, O.P. : Effect of crop regulators on growth, yield and quality of guava. Annals of Plant and Soil Research, 2013; 15: 54-7. Godge, P.V., Kale, P.N. : Developmental physiology of ber. Journal of Maharashtra Agricultural University, 1991;16:224-5. Dubey, A.K., Singh, D.B., Dubey, N.: Crop regulation in guava (Psidiumguajava) cv. ‘Allahabad Safeda’. Progressive Horticulture, 2002;34: 200-3. Garasiya, V.R., Patel, N.M., Bhadauria, H.S., Wankhade, V.R. : Effect of plant growth regulators on quality of winter season guava (Psidiumguajava) cv. L–49 (SARDAR).Asian J. Hort., 2013;8: 347-9. Rajput, C.B.S., Singh, S.N. : Effect of certain plant growth substances in guava. Haryana J. Hort. Sci., 1977; 6: 117-9. Xiao, J.X., Peng, S., He-Hua,P., Li-Jiang,H. : Effects of calcium nitrate and IAA on calcium concentration and quality of Satsuma mandarin fruit. Fruit Sci., 2005; 22: 211-5. Chaudhary, A.S., Singh, M., Singh, C.N. : Effect of plant growth regulators maturity of loquat. Hort., 1990; 22: 184-90.